This is the place to find all of the shades featured in our Lip Palettes individually! Created by us and a bevy of famous make up artists, actresses and super models! 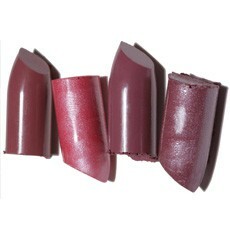 Soon these shades will be available for your refillable TRIO! a gorgeous sheer pink with a smooth gold shimmer. A Century in Red - A collection of the most stunning Reds of our time, celebrating the beautiful women of the 20th century, the trends we couldn't live without and one beautiful shade for our future. (1940's)—The color that endured WWII, a rich blue-red. (1950's)—A bright orange-red that Lucy would love. Favorites Palette - a collection of gorgeous glosses that honors some of our favorite women (from models to makeup artists), and is as colorful and eclectic as they are. Designed with Syl Tang for HipGuide! For the woman who has a drawerful of lipsticks at home - and none of them the perfect shade. This palette contains White, Black, Silver, White Frost, Opal Frost, Cool Gold, Warm Gold, Copper, Sheering Gloss and space for blending. The ideal tool to help you make your lipsticks perfect for you! Warm Lipstick Palette - full coverage and semi-matte (our signature lipstick texture), our Warm Lipsticks were designed for golden skin tones and contain high pigment levels and have long staying power. Cool Lip Gloss Palette - designed for Rosey skin tones, these sheer glosses have a moist and creamy texture that is not tacky or sticky. Infused with a dash of gold shimmer which creates an eye-catching fullness to the lips. Warm Lip Gloss Palette - designed for golden skin tones, these sheer glosses have a moist and creamy texture that is not tacky or sticky. Infused with a dash of gold shimmer which creates an eye-catching fullness to the lips.